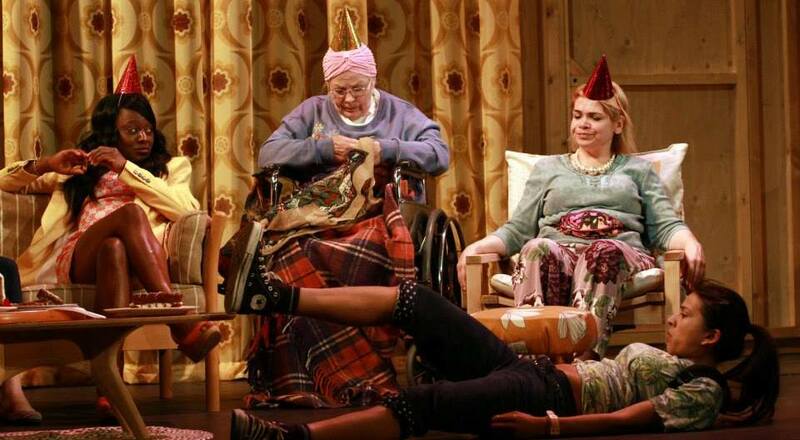 To say I absolutely hated Nikole Beckwith’s Untitled Matriarch Play would be boring, blunt and inaccurate. 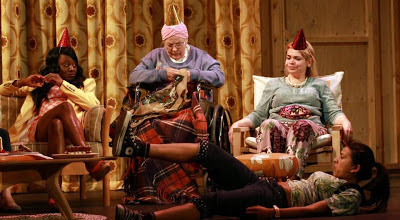 The story contains seven female characters – Sylvie, the grandmother; Lorraine, the mother; Karen, Mimi, Claire and Beckah, the daughters; and Sera, the surrogate mother of Lorraine’s putative next child. The plot essentially consists of the four daughters, aged 35, 33, 28, and 15 being alarmed to discover that their caustic and not very noticeably loving mother intends to have a son via a surrogate and sperm donation. A second plot strand briefly emerges 1hr20 in when 28-year-old daughter Claire – she’s the one with allergies to everything and severe depression (or maybe “issues”) – reveals that she is going to move in with Sera (in what context is unclear) and sue Lorraine for custody of the child. The grandmother sits in a wheelchair and makes bitter observations throughout. So one problem is that the play is largely dramatically inert. God knows, I of all people don’t mind a lack of drama. But when it feels like that’s what’s been aimed for and missed, rather than a deliberate stylistic choice, that’s different. Instead, the cavernous 1hr45 running time of this comedy is filled with more-or-less non-stop wise-cracking. And the subject is more or less entirely centred around motherhood and/or child-bearing, with a hefty side order of complaining bitterly about not having partners, boyfriends, husbands (or in the case of Lorraine, of complaining about the ex-husband). It feels like the revenge play written by someone who got dumped by the Bechdel Test. In common with the other American play downstairs in Open Court, Death Tax, every character is narcissistic, solipsistic, selfish, and unable to comprehend anyone else to the point of autism. (Until – SPOILER ALERT – the last minute, when Lorraine has did, and suddenly everyone decides to be lovely to each other.) That said, given the near-total apparent lack of agency that anyone in this play has over their life (other than the freedom to be completely and exclusively absorbed by it), it feels more like what Friends might have been like if it had been written by Samuel Beckett. Which, staged right, might actually be quite interesting. Which brings me to what I think is the real problem here (aside from the grotesque late-capitalist characters, who might be satire for all I know): I think – at least on Wednesday night – the production (dir. Vicki Featherstone) hasn’t quite nailed the play. Which, obviously, on a week’s rehearsal is totally fair enough. But the flip side of knowing why it’s fair enough that a production hasn’t gelled is that it doesn’t make it any easier to sit though. I spent a good deal of time wondering about this (Mostly during the monologues (oh, yes, there are “to-camera” monolgues too), which I found particularly hard to remember to watch.) And wondering what might be done differently. What has been done is that an ensemble cast of very fine British actors have donned New York accents and essayed a range of sassy or shrinking types. In a way, I think it is the slightly broad-brush-y-ness of these characterisations and the drive to hit the jokes which hides the problems of the production and makes it look more like the problem of the script. Initially I was reminded of the strange burlesques of René Pollesche, in which (typically) large female casts offer an almost transvestite parody of femininity. And I’d have been interested to see the version of Untitled Matriarch Play staged like Ein Chor Irrt Sich Gewaltig. But then I went the other way, and wondered if it wasn’t the amped-up-ness of the quick-fire delivery that was the problem. Rhythmically, it did lapse into long stretches where the dialogue felt like a two-way version of Robert de Niro asking if someone was looking at him. I wondered if, given a bit of space, breathing, and humanity, the jokes might have been less the point and more the by-product, and funnier for it. I dunno, I’m not a director. The last thought I had, was wondering whether the real saboteur here was the ensemble principle itself. I know this is going to sound like rank hypocrisy, given my general position on how all theatre should be gender-, disability-, colour-, age- and accent-blind – and in general I think this still holds, certainly for all imaginatively staged theatre with a proper rehearsal time. However, for boulevard theatre which relies on certain cultural types, I wonder if the path of least resistance might also make the most sense. For example, while it might be interesting – if controversial – to stage plays which hinge on a strong ethnic identity like The Amen Corner or Fences with mixed casts and non-naturalistic settings, it occurred to me that that might be pretty much what had been done here. I don’t know if the play is specifically Jewish, but that’s my guess at the mileau in Beckwith’s mind. So, in a way, I wonder if the problem here might best pictured by imagining a British ensemble doing Annie Hall with a week’s rehearsal. My guess is, it might be harder to gauge the true comic potential of the script. Also, if it is a play about Jewish characters, and that has got lost in this staging, then I wonder also what additional resonance has been lost along with it. The Grandmother, Sylvie, is old enough in the play to be a Holocaust survivor. The brief explanation she gives of the death of her son – “he drowned on a train” I’m pretty sure she said – well, people tend not to drown on trains. Trains are generally pretty water-free. So what train did she mean? And drowned? By his mother, in preference to arriving alive at that train’s destination? I’ve no idea, but I did suddenly realise in retrospect that there was perhaps something bigger behind this text than simple worries about biological clocks. Perhaps a huge lot more. Of course, I might equally be massively over-reading that, and they might just as easily be W.A.S.P.s. And perhaps, even the Jewish reading had been the case, the relentless flippancy and gag-o-rama of the whole thing might still have turned my stomach enough to make me dislike the piece intensely. And even dislike it all the more for trying to bring the Holocaust into something that may still ultimately be revealed as a dispiritingly shallow excuse of an examination of women’s reproductive needs, desires and rights. Think you hit on a lot of stuff I agreed with and couldn't articulate. Great actors and I adored one in particular, but I wish they hadn't been so shouty. When Sera spoke it suggested what else the play might have been.